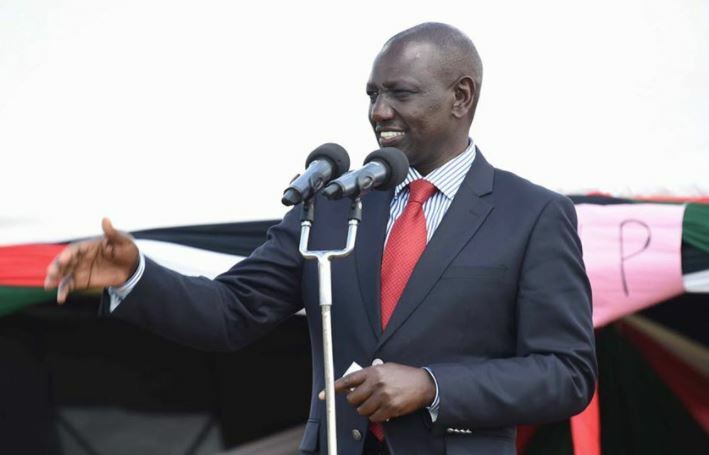 Deputy President William Ruto has ruled out the creation of a Prime Minister post as the end result of the recent unity pact between President Uhuru Kenyatta and Opposition Chief Raila Odinga. During the homecoming party for International Trade Principal Secretary Chris Kiptoo at Chepkosom Primary School in Uasin Gishu County on Sunday, the DP told off politicians saying they were misinforming Kenyans about the deal and trying to mock voters. “Some leaders have no understanding of our meeting with the Opposition. They think we are meeting to secure jobs for individuals,” he said, noting that the handshake should benefit citizens, not leaders. “Even if we amend the Constitution, it should not be for the creation of positions like an executive prime minister,” he said. The DP said some politicians are planning to have the county run by an ex-executive PM elected by MPs in a parliamentary sitting. The remarks come after a meeting between Raila and former President Daniel Arap Moi in Kabarak on Thursday last week. Elgeyo Marakwet Senator Kipchumba Murkomen criticised the meeting saying it may have been “a 2022 presidential contest disguised as a handshake”. “There is no problem with people shaking hands. This should however not be used to play politics. We should depoliticise the country until 2022,” said Murkomen. He added that the era of Kenyans voting for political dynasties is over. “We want to change Kenya’s politics. Kenyans should vote for somebody whose father they have never known,” he said. The Senate Majority leader further accused Baringo Senator Gideon Moi of stopping certain political leaders from visiting his father.